Most rabbits love vegetables. They add variation to the diet and are entertaining to eat. Vegetables also contain many nutrients your rabbit need. The high water content helps hydrate the intestinal content, and further improve digestion. It is very important that vegetables and other types of fresh food are introduced slowly and carefully. It is often best to introduce just one kind at a time. Don’t be tempted to give your rabbit large amounts in the beginning. This can cause soft stools, diarrhea or stasis. Start with one vegetable (e.g. celery). Offer a small piece and wait for at least 24 hours. If there are no soft stools, a larger piece can be offered the next day. If the droppings get soft, discontinue the introduction, and try again some other time. Take your time, and allow 5-7 days to introduce each vegetable. The digestive tract of young rabbits is not fully developed and they may suffer diarrhea if the diet is changed. Watery stools are, however, more often the result of an infestation of the digestive tract by coccidia, a major cause of death at this young age. Young rabbits will start to nibble on hay and fresh vegetables after leaving the nest, at age of 2 or 3 weeks. If the young does not suffer adverse effects, this natural behavior should be encouraged, so to help develop a healthy bacterial flora in the intestine. If a young rabbit does not handle fresh food well, it should be stopped during a few days, and then reintroduced slowly. Other causes like parasitic infestation or environmental conditions should be ruled out. Video of young rabbit nibbling on fresh greens. 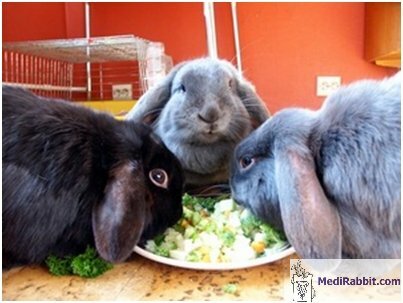 An adult rabbit should be offered at least 3-6 different types of vegetables every day. Be sure to vary once in a while to keep it interesting. 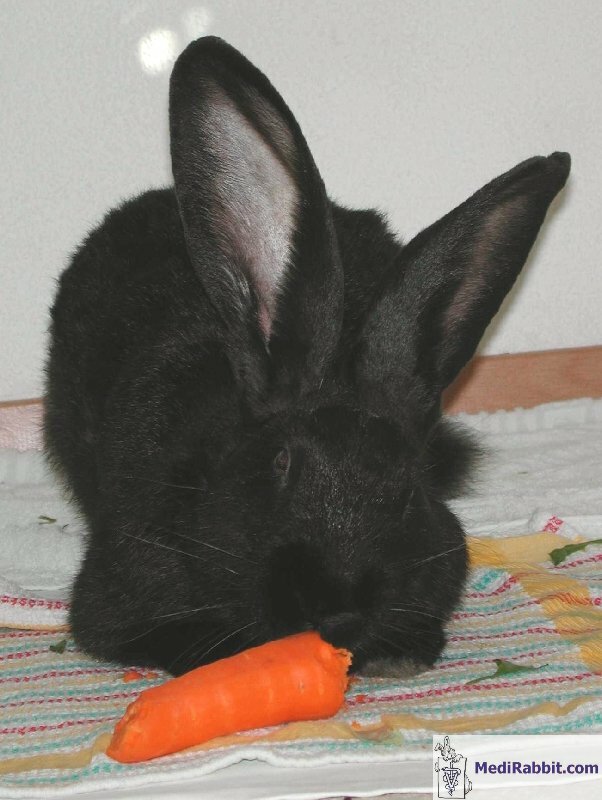 A 6 lbs rabbit should have between 1 ½ and 2 ½ cups of fresh vegetables a day. It is an individual matter which, and how much vegetables a rabbit can tolerate. You might have to experiment a little to find the perfect balance for your rabbit. Debbie Hanson, with the collaboration of Barbara Schmeitz and the rabbit Pixel. At least one of the daily vegetables should contain vitamin A (e.g., beet tops, broccoli, carrot tops, dandelion leaves, endive, cress, chicory). 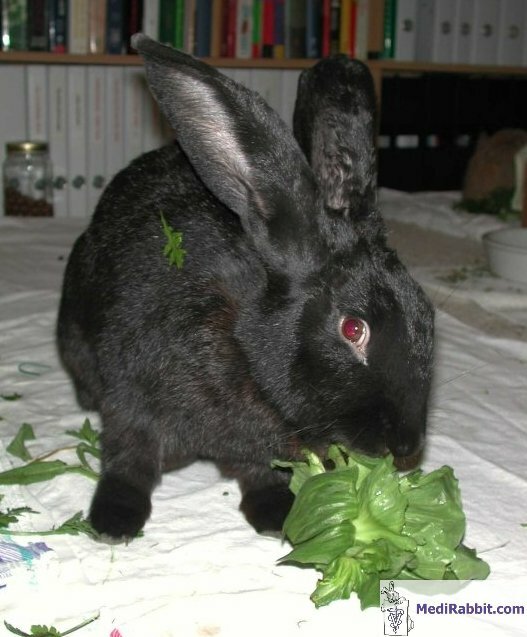 • Dark green and red lettuces are OK, but the light green varieties (iceberg) can cause diarrhoea in some rabbits. • Cucumber and iceberg lettuce contain almost no nutrients and some rabbits can get digestive problems. • Too much cabbage can cause enlargement of the thyroid and digestive problems.